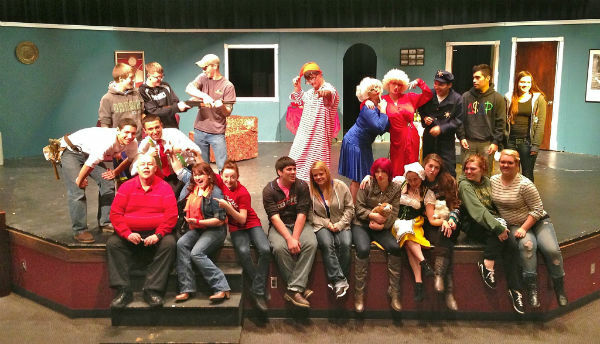 Liberty High School in Liberty, Texas produced my Christmas one-act THE CHRISTMAS SPIDERS in December 2017. A poor family in Ukraine has a tree but can’t afford decorations. Meanwhile, three spiders living in the house decide the only place safe from the cleaning is the tree. Santa turns their webs into tinsel, delighting everyone. Cast: Six or seven. If six – four female, one male, one non-gender. If seven – four female, two male, one non-gender. Running time: 20-25 minutes. Spiders hiding behind the tree. Director Joseph Roberts share more photos here. Former Roanoke city manager Chris Morrill sends this photo of curtain call for JOY TO OTHER WORLDS, my one-act that was in the Paragaon science fiction festival by Otherworld Theatre in Chicago on Nov. 12, 2017. Here are some awesome productions from “Curiosity Killed The Cat,” which was produced May 5-6 by Red River Revue in Clarksville, Texas. Photos by Robyn Hutchinson Blount. The full gallery is here. * More posters and set-up photos. Here’s a full list of my productions(and staged readings) in 2015. Here’s a photo from “On the Thirteenth Day of Christmas,” which was produced this month at Santiam High School in Mill City, Oregon. This was the first production of this script, and the sixth full-length script I’ve had produced.